Flora - Illustration store PicsForDesign.com. PSP tubes, PSD illustrations, Vector illustrations. Brand new kit by Whisper In the Wind - "Flora." 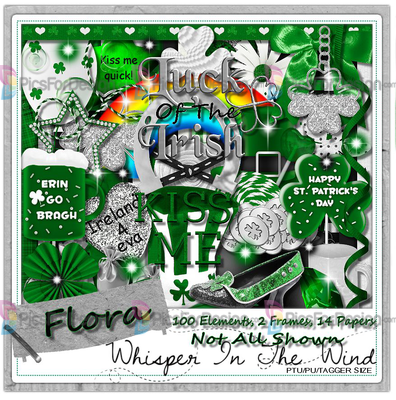 This kit is a match for the stunning new Flora tube by Chris Pastel...it is designed to match the St. Patricks' Day layers. This is a gorgeous St. Paddy's day kit with shades of green, white, and black, and a rainbow thrown in for good measure, lol. It has 100 elements, 2 frames, and 14 papers.